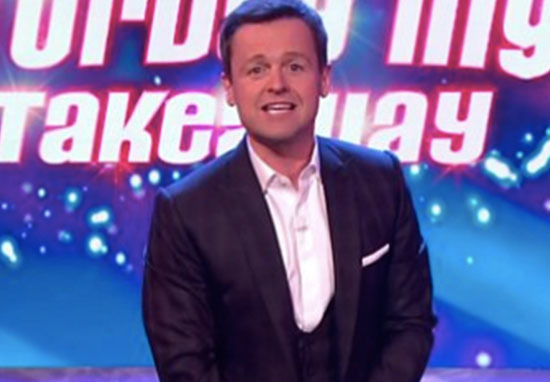 This Saturday just gone, the UK watched live on ITV the first ever showing of Ant & Dec’s Saturday Night Takeaway without Ant. Though the show as a whole went on professionally and without any incident, there was something a little eerie about seeing Dec stood alone on that stage when he’s spent his entire career presenting with his co-host and best bud. However Philip Beresford, an Ant and Dec super-fan who attended the show recorded the moments after the cameras stopped rolling. I was and am a massive fan of the show and fortunately I won tickets in a competition. I’m a huge fan and really wanted to see and Ant and Dec. It was upsetting not to see Ant and Dec together and it didn’t feel right. Dec did good job to be fair but it always should be Ant and Dec. However perhaps the most poignant thing Philip captured was an emotional off-camera hug shared between Davina McCall and Dec. Considering the bulk of the show seemed to go ahead as normal, the heart-warming hug at the end of the show, appeared to be McCall’s way of reassuring Dec that he did a great job despite the difficulties the week before had plagued upon him. It was at the end of the show. Dec gave a heartfelt speech once the cameras stopped rolling. Davina was speaking to him and they spent a long time hugging and she was reassuring him. There was a strange atmosphere without Ant but Dec held it together though he was visibly upset once the cameras stopped and he thanked the audience for their standing ovation. The warm-up introducer encouraged the audience to give an extra big welcome to Dec. Following his arrest for drink driving, Ant McPartlin returned for a lengthy stint in rehab and will miss the rest of Saturday Night Takeaway and almost definitely I’m A Celebrity Get Me Out Of Here and Britain’s Got Talent. However, despite Ant missing the show, ITV bosses are reportedly looking to go out with a bang in Florida by securing some big names for your viewing pleasure. Dec will be joined will be joined by none other than Hollywood actress Denise Richards and singer Craig David for the final episode, according to reports. even for a quick night out you make me feel like a girl put together @lexikleyla thank u for my face paint & hairdo ? They will all head over to Universal Orlando Resort in Florida for the live finale alongside the series’ competition winners. So the initial fears the show would be cancelled after Ant had withdrawn from presenting duties sound well-and-truly over. But will it be the same? I highly doubt it.